Critical Gender Studies hosts the annual Nicholas Papadapoulos Lecture in LGBT Studies. This endowed fund was left to UCSD and Harvard by the family of alumnus, Nicholas Papadapoulos, who died of complications from AIDS in the 1990s. Through the generousity of the Papadopoulos family, this lecture has brought major figures in the broad field of LGBT studies to campus. See the list below for more information on upcoming events. 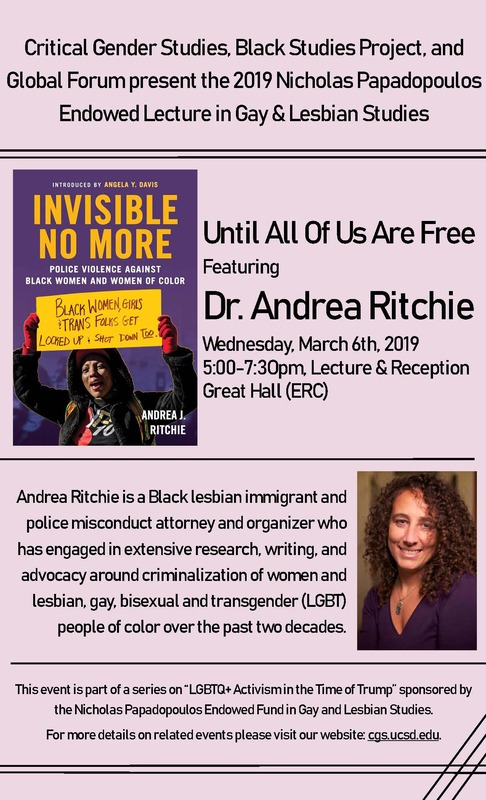 Andrea Ritchie is a Black lesbian immigrant and police misconduct attorney and organizer who has engaged in extensive research, writing, and advocacy around criminalization of women and lesbian, gay, bisexual and transgender (LGBT) people of color over the past two decades. She recently published Invisible No More: Police Violence Against Black Women and Women of Color now available from Beacon Press. "Black Feminist Genealogies: The Making of SOLHOT-Lex"
"The Asylum: Alternative Sonic Registers of Black Girlhood"
We Levitate is a band made up not of musicians but scholars who met through the work of Saving Our Lives, Hear Our Truths (SOLHOT), a praxis of Black girlhood celebration. We Levitate is unapologetic in their use of “doing digital wrongly” to reimagine the collective, resound complex Black girlhood, remember relationships, reclaim the dirty work, and reverberate love for self, each other, and every kind of Black girl everywhere. Entangled in collective dreams of Black girlhood, we are free together; a reverb of loud, extra, Black girl genius. Haneen Maikey is a Palestinian queer community organizer, co-founder and the executive director of the national Palestinian LGBTQ organization "alQaws for Sexual and Gender Diversity in Palestinian Society." This lecture shares the grassroots experience of alQaws– the national LGBTQ Palestinian organization--to frame a discussion on how to challenge oppressive systems and offer creative strategies for leading real change in how Palestinian society perceives sexual and gender diversity issues. Screening of the award-winning OUT IN THE NIGHT, a feature documentary by blair dorosh–walther that tells the story of four African American lesbians from Newark NJ, who became criminals after they defended themselves against a homophobic street attack in 2006 in the West Village of NYC. A conversation with the filmmakers and the four women featured in this film – who became known as the NJ4 – will follow the screening. A lecture series exploring the visual culture of black LGBTI youth from various South African townships. The visual activism approach will be used to understand realities of black queers born at the end of apartheid in SA focusing mainly on visual expression of the Black Queer Born Frees. The new generation born in the post-apartheid SA is also known as 'Mandela’s step great-grandchildren.’ The lecture will emphasize how the activist negotiated the production space/s interacting with those born from 1990 to 1994. E. Patrick Johnson is the Carlos Montezuma Professor of Performance Studies and African American Studies at Northwestern University. A scholar, artist, and activist, Johnson has performed nationally and internationally and has published widely in the area of race, gender, sexuality and performance. He has written two award-winning books, Appropriating Blackness: Performance and the Politics of Authenticity (Duke UP, 2003), and Sweet Tea: Black Gay Men of the South— An Oral History (University of North Carolina UP, 2008). A conversation on filmmaking and activism, intersectionality, queer storytelling, and women of color in the media with special guests Kim Yutani and Aurora Guerrero. Kim Yutani is a Programmer at the Sundance Film Festival as well as Director of Programming of Outfest, the Los Angeles Gay and Lesbian Film Festival, and the LA queer of color film festival, Fusion. Aurora Guerrero is the writer and director of the award-winning feature Mosquita y Mari (2012), a coming of age story set in Huntington Park, LA, and of a number of short films, including Pura Lengua and Viernes Girl.